Bad news first. But, keep reading on. There is good news too! There has been a delay to the upcoming audio box-set. Sorry. We initially had all scripts cleared by ITV and some great guest casting in place but we decided that we’d like to reverse a few early creative decisions. 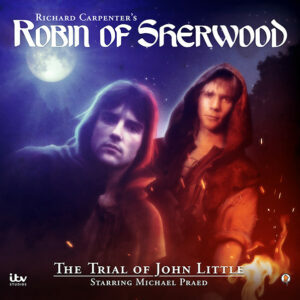 That’s not unusual with this kind of project (essentially, I re-booted the Robin of Sherwood: The Knights of the Apocalypse project when I teamed up with Spiteful Puppet to finish it with me) and it’s really not something to worry about. You don’t usually hear of them but, because I like being very open with fans, we felt we needed to keep you informed. This wasn’t an easy decision but, with the full support of ITV, Kip’s Estate and the cast themselves, we’ve adjusted our time-frame. So while you’ve been patiently waiting for news of an Autumn release, we’ve been feverishly working on new critical timelines for approvals, schedules and recording dates. With a few months of post-production and sound design to do after the voice recording sessions, the new adventures box-set is now likely to be available in Spring/Summer of 2018, around the time of ‘The Hooded Man III’ Robin of Sherwood convention. 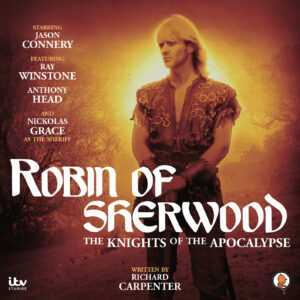 In the next couple of months, there ARE going to be a few special Robin of Sherwood audio releases! These will be in the form of enhanced audiobooks. In these audiobooks, members of the main cast will read brand new stories, enhanced with sound effects and a musical score. One of these stories will be given away FREE to all those who have pre-ordered the full-cast box-set up until this point. Each story will be approximately 45 minutes and will retail, for download, at £4.99 each. There are several stories in pre-production, and there may even be a Christmas special if we can manage it. As ever, things are subject to change, but we’ve had clearance from ITV and all is on track. What’s an enhanced audiobook? For an example, here’s a link to the style that these audios will take (although this is a long-form poem). 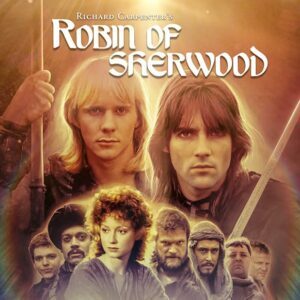 It features a narrator, a performer, soundscape and music; though this example is a lot shorter than the Robin of Sherwood stories will be, it gives you an idea of what to expect. Any further updates on the release? Also my pre-order shows as shipped, is that the same for everyone? Barnaby here, the Producer of ‘Robin of Sherwood’ for Spiteful Puppet. Sadly, we have had several unavoidable set-backs, which we were very upfront about, and offered a free download to fans like yourself who pre-ordered (‘The Blood That Binds’, read by Nickolas Grace). We’ve stopped blogs recently, due to lack of activity as we wait for the studio dates to roll round but, coincidentally, on Monday they will start again as the first actor (Jason Connery) goes into the studio. This month, and next month, we’re in the studio a lot. Then, sound design and music production will be done. We’re on course for our Summer 2018 release date – which we announced a while back. Obviously, you have waited a long time for your box-set and we can only apologise for that. But, we do really appreciate your purchase. The pre-orders allowed us the budget to make the product we’re producing. If you are on Facebook or Twitter, feel free to follow us as we’re more active and more regular on there.